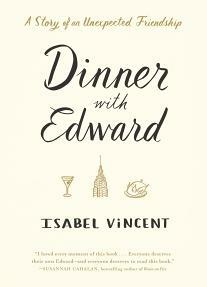 A review of Dinner with Edward by Isabel Vincent. Post may contain affiliate links. As a food blogger, I am partial to books that contain food in some way. So, I loved Dinner with Edward because of all the mentions of food. However, I also love it because of the writing, the story and the characters. We first meet Isabel when she is talking with her her friend, Valerie. It is shortly after the death of Valerie’s mother and she is worried about her father, Edward. He is alone in New York in the apartment that he shared with his beloved wife, Paula. She lives too far away to visit him regularly. Isabel has just moved to New York to work as a reporter. She is struggling with a marriage that is unraveling and it’s impact on her young daughter. When Isabel tells Valerie that things are not going to well in her life either, Valerie suggests that she have dinner with Edward. She tells isabel that he is a very good cook and perhaps this would help him. Isabel arrives at Edward’s apartment for dinner, not knowing what to expect. What she gets is Grilled Sirloin Steak, Sauce Bourguignonne, New Potatoes, Chocolate Souffle, and a lovely bottle of Malbec. What she also gets is the beginning of a wonderful relationship with Edward. This is the story of that friendship. The stories they share, all over lovingly described dinners. It is an unlikely friendship, but one that flourishes. Two people needing each other at the right place and the right time. I admit that as a foodie, I loved the descriptions of the food, the effortless way that Edward cooked. But I don’t think you have to be all that involved with food to love this novel. The friendship is the heart of the story. I loved this book!I received an ARC copy of this book. This sounds like a great book. Nice review, I am adding it to my Goodreads list.